I will communicate my grievances and let them go. 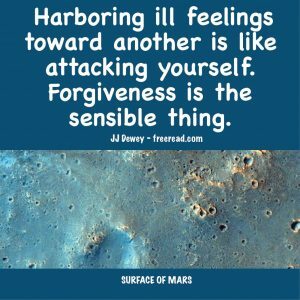 You may have done everything possible to decide to forgive the person who is behind the grievance and have reasoned within yourself that it is best to just let it go and move on, but the grievance remains. You are left with a Type Two emotional grievance to which your emotional self has attached. Your feeling nature is ignoring the mind and exercising its own power and authority over your life. When your emotional self makes such a stand you have to speak to it in its own language. It doesn’t understand logic and reasoning. It only understands communications with feeling behind them and the seeker must deal with it in its own language. Let us go back to the situation with Jill and Joan. Jill’s emotional self felt very warm about the poem she wrote and was devastated when it felt as if Joan attacked it. Jill’s mental self tried to reason the hurt away, but the emotional self would not have it. It wants justice meted out on an emotional level. If justice was up to the emotional self it would influence Jill to attack Joan on the next encounter and show her how it feels to be criticized unjustly. Here the mind of the seeker must step it. The solution cannot be left up to the emotional body or tragedy will be the result. When a grievance is involved the solution the emotional self comes up with always involves attack and revenge. (1) The mind can acquiesce and let the emotional self have its way. Joan will attack back and probably destroy the friendship. (2) The mind can refuse to let the emotional self have its way and just continue the relationship as if nothing has happened. This is the course taken by most minds, but the problem is that the grievance remains and will cause problems as soon as the mind relaxes its control over the feeling nature. (3) Jill can have a heart-to-heart talk with Joan and communicate as harmlessly as possible the hurt she feels. Jill: You may think it is kind of silly, but you really hurt my feelings after you read my poem. Joan: Really? I didn’t mean to. What did I do? Jill: I know you’ve written a lot of poems but I have just written that one. That was my first attempt and I put a lot of heart into it. When I showed it to you I thought you would see the feeling I attempted to convey and identify with it. Instead, you responded dryly that it was corny. That really hurt my feelings. It may seem silly, but I can’t shake the hurt. Joan: I didn’t realize that was your first poem or I would have been more understanding. Yes, the poem did have heart and it was touching and by “corny” I did not mean it was bad, but kind of old fashioned, but that is sometimes a good thing. I suppose my correcting your English didn’t help. Jill: (At this point Jill’s emotional self is already feeling much better) I have to admit that added fuel to the fire. You came across like an old fashioned schoolmarm reviewing the paper of a failing student. Joan: (She laughs) I can be that way at times. I hope I didn’t discourage you from writing more poetry. If that was your first poem, then overall it was really pretty good. The two give each other a hug and the grievance is completely replaced by warm loving energy strengthening the bond beyond what it was before. So, what happens if Joan is not so gracious, thinks that Jill is being ridiculous and is offended at the insinuation that she caused the grievance? In this case Jill can still let go of the grievance because it has been communicated. Joan’s refusal to have empathy and share in the responsibility will cause the energy of the grievance to settle on her own emotional body. She will now bare the burden of the grievance and will have to deal with it. Today’s assignment: Review possible grievances and see if any are active. If so make a plan to communicate that grievance to the person involved at the earliest possible moment. Do so in as harmless and loving way as possible. If you cannot find an active grievance then make up your mind to diffuse any that come along in the future. Think this thought to yourself throughout the day. The seeker may have followed this course assiduously so far, yet something still seems amiss. Lingering below the surface, subtle hurt resides. What has gone wrong? What must still be done? Two more emotional blockages remain in many souls seeking the path. We shall deal with the first today. Suppression is an enemy at the gate that slows down the progress of many a kind and loving soul who just wants to live in peace. Someone in relationship with the seeker says or does something that offends the emotional body, but not the mental self. The mind explains that the offense was not a big deal and not worth replying to and with the risk of a full-blown argument resulting in hard feelings. Despite the mind making this argument to the whole self, the emotional self doesn’t buy it and continues to be offended. The mind thus exerts its authority and suppresses the feeling nature and prevents it from expressing itself. After a period of what seems like peace, the mind becomes convinced it did the right thing and all seems well. This situation continues until the friend commits the same offense again. And again the mind takes charge and commands the emotions to be quiet. This time the negative energy held by the emotions increases. Then the offense happens two more times and the mind again commands silence to the emotions. The negative feelings accumulate and the emotional self feels it cannot contain much more. It must either release the negative emotions or send a message to the whole self by causing a disease to manifest. Finally, one more visit is paid to the friend and he makes another offending remark. It was fairly mild but it was enough to add just enough fuel to the emotional self to cause it to explode. The energy was so strong that the mind could not hold it back and the self lashed out at the friend with a fury that caused great hurt and alarm. This damaged the friendship but it had a positive effect in that the emotional self did not have to manifest a disease. The assignment today is to again look back on the various emotional hurts you have had in life. Has there been a tendency for you to pretend that you were not hurt when you were? Do not be hesitant at honesty here, for most have made this pretense at one time or another. If you do find a past situation ask yourself how you could have communicated the negative emotion at the beginning to avoid larger problems later on. Now examine your current feelings. Is your emotional self still harboring any negative feelings that have been suppressed by the mind? The solution is the same as the last lesson, which is to find a way to harmlessly communicate the negative feelings as soon as they arise. This may seem difficult but the problem of communicating in the present is much less than the outburst or ill health that can result from suppression. Yesterday we discussed the first cause of emotional blockage which is suppression. The second one which is the subject for today is denial. Denial is perhaps the most complicated cause of emotional blockage and very difficult to clear. Whereas suppression allows both the mind and the emotional self to acknowledge the hurt to be present, with denial the mind creates the illusion that the disturbance does not even exist. The reason is simple. Many seekers see themselves as further along the path than they are, and have concluded that they have risen above being effected by negative emotions. They think that they do not feel any grievance or are subject to negative feelings because they have mastered them. Therefore, the denier goes a step beyond the suppresser. He not only prevents the emotional self from expressing itself, but denies the existence of the grievance felt by the feeling nature when it is definitely real. The emotional self still feels hurt and pesters the mind for permission to communicate. The mind then sees that the emotional self is not cooperating and tells itself that this emotional reaction is silly and not a part of him. He will not only deny the emotions the power to express, but decides to detach himself from any emotions to the point that it would seem that the undesirable ones do not even exist. The problem is that the grievance has not been solved and it does exist. The emotional body was upset enough when suppressed, but now that the mind has denied what is actually being felt, it boils over in a silent rage. It may not be allowed to speak, but it can do other things. Sometimes the message gets through and the person becomes in better touch with his feelings; at other times he will live the rest of his life in pain, bewildered by the cause. The seeker definitely needs to discover any inward denial and expose it if he wants to bask in the spiritual light of the soul as well as maintain health. The problem is that many have denied grievances for so long that they have convinced themselves that they do not exist. If you are healthy and suffering no physical pain then this is a sign that you are not experiencing long-term denial. One who is currently healthy may be subject to a short-term denial for the physical problems take a while to manifest. If you suspect that you have experienced denial then you may want to return to this exercise periodically. Guilt is perhaps the greatest barrier to soul contact and the gifts of the Spirit. Many people associate guilt with a conscience given to us by God, but in this they are incorrect. Guilt is an artificial device created by human consciousness as a means to condemn ourselves and make us feel unworthy. Guilt is the most destructive and useless of all feelings. It is not just feeling bad over a mistake, but is accompanied by a feeling of unworthiness and self-condemnation. Guilt is often associated with sin. If you sin you are then unworthy of God’s Spirit and you need to go through a period penitence and self-condemnation before you dare lift your eyes heavenward again. The word “sin” comes from the Greek word HAMARTANO which means “to miss the mark.” In other words, when the Greeks, 2000 years ago, shot at a target with an arrow and missed, they “sinned” (HAMARTANO) or missed the target. Is this how the word “sin” is used today? Verily no. When the religious person thinks of sin in our age, he generally thinks of being unclean and ridden with guilt. When you shoot at a target and miss the bull’s eye, do you feel degraded and guilty to the extent that you feel paralyzed and even feel unworthy to shoot again? No, of course not. When you miss you may find it mildly irritating, but you generally can’t wait to have another try at it. Guilt has been identified with sin by those who have sought to control the souls of men, but among the enlightened prophets it was not always so. To them sin was seen as a human error and salvation from sin is the path that leads to a correction of error. The prophets in times past did not seek to control through guilt, but sought to shift consciousness from error to perfection as they saw it. The most prevalent sin today (using its true definition) is to be ensnared by guilt, for guilt is caused by, not your conscience, but by an error in human thinking. It is indeed a great error to make a mistake and then condemn yourself through guilt to the extent that you become paralyzed and do nothing to fix the problem until you feel worthy again. When a mistake is made the seeker needs to jump right back in making an effort to improve himself. Guilt is caused by pure illusion and the seeker must dispel this illusion to create and maintain a consistent link between himself and his soul, or Higher Self. Before guilt can be dispelled one must learn the cause. Once the cause is known he can then take steps to transcend guilt permanently. The assignment today is to reflect on three different things in your life that caused you to feel guilty. Then contemplate on exactly what it was that produced the guilt. Many people lump together the feelings of regret and guilt, but there is a great difference between the two. This difference must be understood if guilt is to be transcended, for if you seek to master something that is not guilt, then guilt will remain. An act that causes guilt will usually involve regret, but not all things that cause regret result in guilt. You may regret that your team lost the big game, but you will not feel guilty about it. On the other hand, you would most likely feel both regret and guilt if you were unfaithful to your spouse. Regret consists of feeling that an event didn’t turn out the way you wanted. If it was your fault then you might feel some irritation with yourself and commit to do better next time. With regret alone you may feel like kicking yourself for missing that target or big play, but you will not condemn yourself. Because you realize you are human and humans make mistakes. When guilt comes into play another dimension of feeling is added. The person may feel unworthy, he condemns himself, he usually feels the need for some type of punishment (even though he may not acknowledge this) and if he is a believer he may feel that God is upset with him. The feelings associated with guilt are very painful and persistent, often even disturbing sleep. There is no real peace for he who is afflicted with guilt. Regret comes and goes, but guilt remains and does not let up, like suppressed and denied emotions, guilt often results in physical disease. This is why many were healed when Jesus spoke the words, “Your sins are forgiven you.” When this was accepted by the receiver the guilt was lifted and healing took place. Did this mistake cause me regret only or did I also suffer guilt? Do I have guilt that still lingers? How can this guilt be eliminated? Regret is caused by a mistake you have made and acknowledge, but guilt goes beyond this. Guilt does not come because of a mistake realized by your own intelligence, but from something that disapproves outside of yourself. The answer is quite simple. God. In other words, guilt comes because you think that God disapproves of some action you have taken. This makes you feel unworthy of Him and condemned unless some type of atonement is arranged. So, how do you know that God disapproves of you? Have you talked to him lately? No, but others have told you what God expects from you and they seem to know what he wants. There are also books that tell you what God expects of you. If you accept these pronouncements as actual words from God and then go against them how will you feel? You will feel that you have displeased God and you are as low as a human can get. You will feel guilt. Once an outward authority is accepted as representing the words and thoughts of God then you can be made to feel guilty over going against anything he wills. If this spokesman says you are to not eat peas and you accept this as the word of God, then you will feel guilt if you eat peas, pork, drink coffee or whatever this spokesman says violates the will of God. If you accept an outer voice as representing the voice of God, then he who has this voice becomes a substitute for the true God. You have basically left behind the true voice and accepted a false one. How do we know that the outward voice is a false one? Because no outward voices speak for God. The true voice of God only comes to you from inside yourself. Does this mean that outward voices never speak the truth? No. Outward voices may say many things that are true, but they must be confirmed from within yourself by the true voice. Remember, outward voices also say many things that are false and have nothing to do with God’s will. If someone claiming to be a spokesman for the will of God commands you to not eat peas or anything that seems contrary to common sense you must get verification from the God within. If you realize this then no outer voice will be able to cause you to have guilt. Your assignment today is to trace the source of your own guilt. Think of three different times that you suffered guilt and then think back to whose will was violated that caused the guilt. If you do this successfully you will trace it back to some outward authority. Ask yourself: Why did I accept this outer voice as the voice of God. Why did I give away my power and enter hell through my own free will? The true voice of God comes from within yourself, not from an outer authority. The true voice comes from a source that loves you as a loving parent does a beloved child. Do we as imperfect parents want our children to suffer guilt and condemn themselves? No. And neither does God. Does a loving parent want a child to see its mistakes and make corrections in life? Yes, but such corrections are done with joy and do not involve pain and self-condemnation that comes from guilt. You can only have guilt if you place the authority of a false outward unloving god above the true loving God who speaks to you from the Spirit within. The false outward god does not love you but has delight in your pain and self-condemnation from guilt. A true loving parent would never feel this way toward a struggling child, neither would a true God. The same mind which was in Christ is also in you. The same true God resides there. The false gods are without. The assignment today is to reject the false gods and to accept the true and loving one. Is it not more reasonable, as well as desirable, to choose a true and loving parent over a wrathful condemning false one that sees you not as a true son or daughter? The choice is to go to the fires of hell created by a false god who has contempt for you, or a caring parent who welcomes you with a loving embrace and wants to take away all your pain and grief. When one finds his Source, there is only one choice. The choice is to obey the first commandment. Contemplate these things and imagine God appearing before you as a loving father or mother. Imagine how much you may love your own child and then multiply that love and feel it from God. Does this parent take joy in your pain? Does this parent want to replace all pain with joy and happiness? You know the answer. The answer lies within your mind and heart. Imagine having a conversation with this this true Father/Mother God and feeling accepted much more than any earthly parent. The false god from without does everything in his power to make you think it is the true God. He is very cunning and deceptive. If you say that you only worship the God within, he will tell you that he is within. If you say you seek the kingdom of God within, he will tell you that this is his kingdom. If you want to build an earthly kingdom where brotherly love thrives he will tell you that this also belongs to him. If you proclaim glory to God for all the outward creations then he will claim credit for all of them. If you find a teacher, a prophet or a sacred scripture that speaks to you he will tell you that he inspired them all and can tell you what they mean. The false god is extremely cunning at obscuring the truth. He can make you think that day is night and night is day; that good is evil and evil is good. He turns everything upside down and to test his authority over you, he commands you to believe it and to submit to commandments that defy all logic and spirit of brotherhood. In the past you did believe the deception. You did not realize there was a difference between the true inner God and the false outer one. In your ignorance when you received some loving communications from the inner you gave glory to the outer and thus gave power to the false gods. Your true Source forgives you for this for it knows the difficulty you have in true perception. It knows that if you had recognized it as the true God that you would not have given the false gods a second glance. It also knows that it is only a matter of time before you awaken and realize that your true home is with Him. Your true God resides in the Eternal Now. The false gods reside in time. In the eternal now you ever reside in the arms of our loving parent. This experiment in time is so fleeting it is as if it does not even exist to the consciousness of the true God. It is as if you never left. To the consciousness of the false god it is a life and death struggle to imprison you for an eternity in time with all of its accompanied pain, depression and fear. Like all dreams you will eventually awaken. The only difference is some awaken earlier than others. To take the first step to awaken you must choose the true God, which resides within your heart and mind. You must obey the first commandment. It is the first commandment because it is the most important of them all. It is the key to escaping the influence of all the false gods without. The seeker asks: When I feel guilt I seem to feel it within myself. How can you say that guilt comes from the false gods without? The false gods are outer voices that come in various sizes and shapes. There are hundreds of different religions and belief systems who all have their outer authorities who compete to be the voice of God to you. They are all false gods for none of them represent the true Voice. The true Voice of God only speaks from the innermost part of yourself. The false gods know this so they attempt to deceive you into thinking they are the same as that inner Voice. To achieve this they will speak flowery words which are a mixture of truth and error designed to be accepted by you. If you accept and embrace their words as if they are the words of God you will then allow the words to enter you as an undesirable seed may enter your garden. Thus the true seed and the false seed may reside together for a time. Here is the key to recognizing the true God over the false. The false begins its approach from without and attempts to work its way within to control your heart and mind. The true God begins its approach in your deepest core and when accepted it works its way outward so your whole self is full of light. The outer gods are merely humans like yourself who claim to speak for God, but they do not. The only God who speaks for God lies deep within your mind and heart. When the true God speaks to you there is no guilt, or shame or pain, but only love and understanding and light. So far, if you have paid attention, you can see the theory behind the cause of guilt, which is this. You have misplaced the voice of God and hear it where it is not. Instead of being subject to the voice within yourself you were subjected to voices outside of yourself that seem to speak for God. Dismissing these false voices, which produce guilt, is easier said than done. The false voices have great honor within the world of men and the inner voice is often seen as the product of an unstable mind, not to be trusted. Thus we see that the false voices have a great base of power in the world, not yet available to those who listen to the real voice. The outer voice may be a revered teacher, prophet, scholar, freedom fighter, political leader, guru or book. The outer voice may seem to have great authority, knowledge, spirituality, wisdom and light. He or she may teach many things that are true, but there is one problem. The inner voice will always tell you the truth. If the violation of the words of an outer voice produces guilt in you then deception and error has occurred. This error is what Christ came to correct. To be saved is to be delivered from the error of the outer voices. The outer voices did not want to be negated and they crucified him. When you are delivered from error you are delivered from guilt and taken under the wing of a loving God who seeks to nourish you and take away all pain and shame. What you must do to be saved is to trace back in your mind to the cause of guilt which has manifested in your life. When you do this the source will not be the true voice within yourself, but an outer one. It may be a person or group who have led you to believe that the violation of a certain command is so bad that you are unworthy and must suffer shame and guilt for violating it. To release yourself you must find these sources who have power to command you and let them go. “I care not whether the outer gods are good or bad, but at this moment I let them go. I no longer serve them but instead I obey the first commandment and serve the true God which speaks directly to me. He has released me from the power of outer gods and replaced guilt with love and nurturing.